As a result of the slave trade, through which the vast majority of African immigrants were involuntarily transported to America, the history of African Americans is one rooted in controversy and strife. After the Civil War when Abraham Lincoln abolished the institution of slavery, African Americans began the struggle for civil rights and social and cultural equality in the United States, a struggle that continues to this day despite the gains of the Civil Rights Movement of the 1960s. The election of Barack Obama in 2008 to the American presidency is hopeful evidence, however, of the amalgamation of African-American interests in the country's political system. 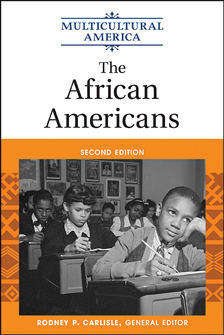 The African Americans explores this particular ethnic group, presenting a remarkable array of valuable information, including entertainment, work, education, and the contributions and conflicts of African Americans to society. This informative volume details their social history, customs, and traditions and is enhanced by further reading lists, black-and-white photographs, and more. General editor Rodney P. Carlisle earned his B.A. in history from Harvard and both his M.A. and Ph.D. in history from the University of California in Berkeley. He is a former chair of the history department at Rutgers University in Camden, where he taught for more than 30 years, specializing in 20th-century history. Carlisle is now professor emeritus there. He has written and edited many articles and more than 30 books on history, including Facts On File's Handbook to Life in America set.